Sautee mushrooms in butter or olive oil with salt. Let them brown. Put over water and wine, simmer for 30 minutes. Strain and put the mushroom solids in a sturdy cloth and squeeze out all the liquid. Discard solids. Combine porcini powder with flour and egg. Knead into a smooth ball and lightly oil. Roll out into a very thin sheet (without extra flour) and cut by hand into extra thin noodles. Let these dry slightly on a wooden board. Sautee three slices of portabello mushrooms in butter, salt lightly. Heat the mushroom stock and add milk. Add the noodles. When cooked through arrange in a bowl with the mushroom slices, a sprig of dill and a dollop of sour cream. 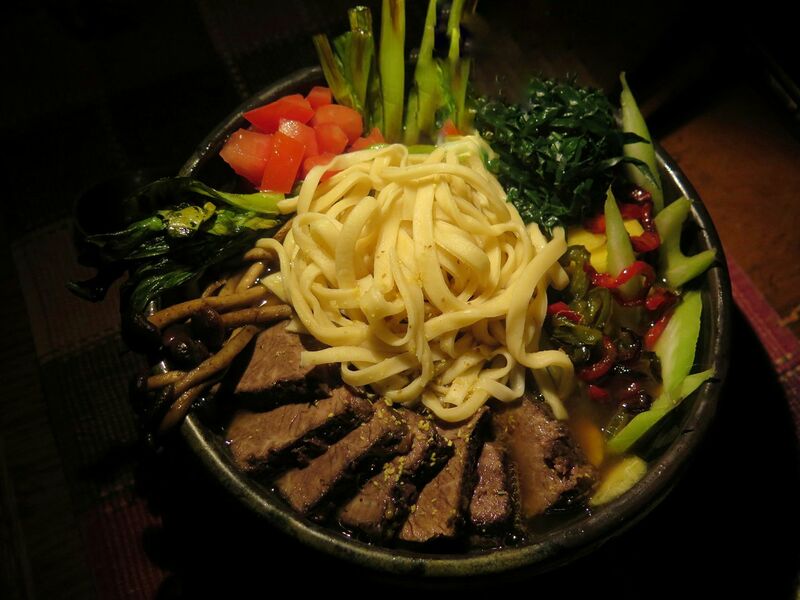 Laghman is a pulled noodle, a version of what was once Chinese la mien.